After dance pioneer Alvin Ailey died in 1989, the future of the Alvin Ailey American Dance Theater was uncertain. It’s difficult to keep a dance company profitable after its founder is long gone – many have tried and failed. But 30 years later, the group is thriving, and decided to celebrate its 60th anniversary and founder by commissioning a new work titled Lazarus. 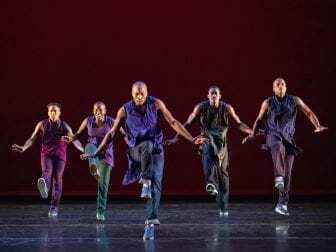 The company chose choreographer Rennie Harris, who formed the first and longest running hip-hop dance touring company to create the hour-long piece. Harris is the first artist-in-residence for the Alvin Ailey American Dance Theater, and was tasked with creating the first two-act work the company has ever had. His previous contributions to the contemporary dance company include Love Stories and Home. Harris’ first company, Rennie Harris Puremovement, has traveled the world and was chosen to serve as citizen-diplomats for the U.S. Department of State’s DanceMotion USA in 2012. The Philadelphia native has also received various awards, including the Herb Alpert Award in the Arts, and was voted one of the most influential people over the past 100 years of Philadelphia history. The Alvin Ailey American Dance Theater‘s Lazarus premiered in late 2018 at the New York City Center. The company is currently traveling across the United States to perform it this anniversary piece until its last regional stop in Newark, New Jersey on May 12. Lazarus is inspired by Ailey’s experiences growing up in Texas in the Jim Crow era and features a 15-person cast that takes audiences through the racial inequalities that Ailey had to face in his lifetime, some of which hold true today. Like most African-Americans, we started at home with the family, you know. So I couldn’t really say when it was, because I just know that I actually did it. And I did it throughout my childhood. I mean, I kind of flipped straight to professional from when I turned 14/15 years old. And I started to meet people who asked me to perform the, what’s it called, the fish fry, the church bazaar event, the talent show, open up for the talent show at the church and I’d get paid. And so I would get a couple of guys and … we would dance, well, you know, get $50 and we split $50. It was like $10 each and like we thought we came up. We thought we got over, because you know, had they asked us just to do it, we would have did it for free. Movement is the last manifestation of our reality right? Our action defines who we are. A lot of times we like to think that our words are, you know, oh, ‘I’m this kind of person.’ That kind of thing. And really it’s an action. We know a person loves us because of the action that they take to show us, right? And so, the same thing when it comes to dance as an action right? So would dance if you really want to know what’s, why this particular movement, or style, or movement as a whole, cultural movement is important or relative. Then you want to study what was going on politically, economically, and socially in that particular era. And so whatever that was, the expression, the physical expression, is embodied – and that’s the last manifestation of how a person may feel. So after I stopped freaking out about it, it’s OK, then I’m really focused. You know, let me figure out this thing, there’s three parts: 20 minute, 20 minute, 20 minute, just think that way. Get through the first 20 minutes, we good. Then I could figure out the other 40. So that was the first goal and I thought in the same way I wanted to address slavery. Slavery, post slavery, and civil rights. And because I found it interesting, you know everyone talked about Mr. Ailey, you know, although the works I’ve seen on him they talked about him the man and I wanted to say showcase what was happening around him and how he forged this vision through all of that. People want change and I think sometimes they need a little pick-me-up or a little pushing and a reminder. And I think you know, because it’s not just the American story, it’s a global story. I mean, we’re talking about spirit and journey and that represents a global story to me. But I think you know people when they ask for that American story that’s really what they want and this is that inspiration that they need for themselves. And you see it around the world. People are doing it. However, it’s not enough of us, you know, there are a lot of us who have great intention and we want to but we are so afraid of loss of losing that we are stuck and once we lose the idea of fear and lose that feeling, that butterfly feeling that’s physically in your body when you become afraid, when you lose that then I think we’ll be more progressive as a planet but we’re afraid of losing.